The region of Razgrad is rich in cultural monuments. The archeological reserve of Sboryanovo is testament to the different cultures that have flourished here. A major archeological find in this reserve is the Tomb of Shvestari, an ancient Thracian burial mound discovered in 1982. The ancient town of Arbitus is also located nearby, with ruins of ancient settlements and a preserved medieval one. Ethnic Bulgarians like the Alians (or Kazilbashi) still live in the towns of Kubrat and Isperih, their fascinating customs a link between past and present. Much of Razgrad’s economy derives from the pharmaceutical industry and from agriculture. Tobacco is grown in large quantities in the region. Razgrad is a cosy town blessed with a year-round mild climate. The locals are very hospitable to foreigners. Hunting and fishing are popular in Razgrad, and the nearby villages are perfect locations for settling into a villa or bungalow. Razgrad City was once the ancient Roman town of Arbitus. Set idyllic countryside, along the banks of the Beli Lom River, it’s an easy drive to the bigger cities of Varna and Rousse. The city offers many cultural landmarks, mostly from the 19th century. The old part of the town includes Varosha, which is considered an “architectural reserve”–the buildings, monuments and narrow streets of this medieval settlement are preserved. 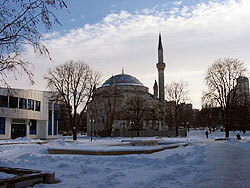 The Ibrahim Pasha Mosque, built in 1530, is the Balkans’ third largest. Its reconstruction is still underway, though, because of interruptions during the Communist regime. There are some museums in town, the most interesting probably being the Ethnographic Museum. Razgrad is the centre of Bulgaria’s pharmaceutical industry.